Ahoy finishes its first season on a high note with this final issue of their humor/horror anthology. Personally I’m a hard sell with that combination. 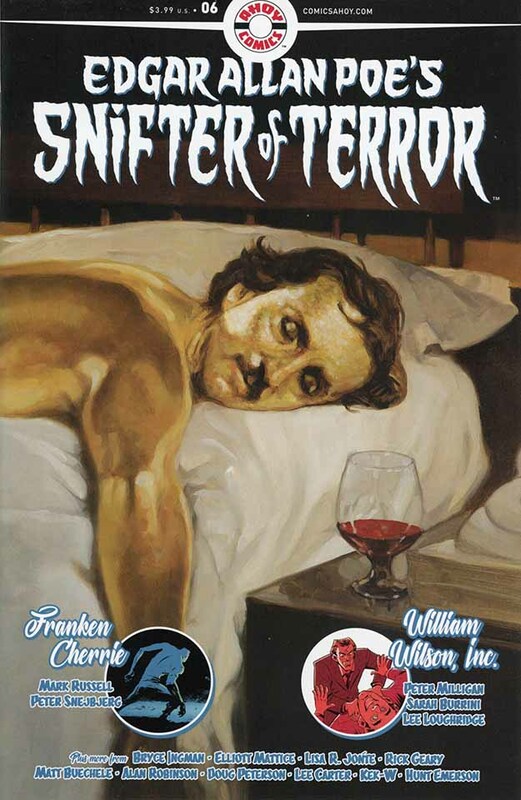 If it’s scary, it’s usually not funny, and vice versa, but for the second time in the series, writer Mark Russell and artist Peter Snejbjerg have perfectly combined gothic horror with surreal Monty Python humor in “Franken Cherrie.” Like “Dark Chocolate” in issue 1, it takes characters inspired by breakfast cereal mascots and makes their stories over in a dark but hilarious bowl full of tragedy and death. I rarely laugh while reading a comic, but this one did make me laugh quite a lot! The third and concluding part of Kek-W and Lee Carter’s “Le Duc De L’omelette” did as little for me as the first two, but I did like Peter Milligan and Sarah Burrini’s “William Wilson, Inc.,” a clever and amusing fable of a company supplying clones to busy, rich men so those men can have more fun. It isn’t at all scary like the Poe story, but I liked it anyway. As usual, there are also several text features, and this time a crossword puzzle. “Franken Cherrie” is a must-read, and well worth the price of the entire issue. I hope there will be more of these stories in the future. Recommended. This entry was posted in Comics, Reviews on March 18, 2019 by Todd.